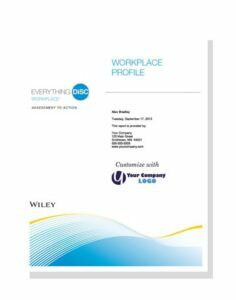 Everything DiSC® identifies your own motivators, fears and behaviors to identify your style. It’s a self-assessment tool that helps you to become incredibly aware of your style behaviors and how they impact others in a neutral, negative and positive manner. It is not a test. It stretches you as a communicator because you can address uncomfortable issues with more confidence and objectivity. It builds upon communication and teamwork skills to improve work relationships, less chaos, and less unhealthy conflict when the tool is used. Working better and more effectively saves money, time and energy. Are you interested in working in an environment that is more effective? Lessons the time of conflict and frustration? Saves time, money and energy? Please read further to identify which Everything DiSC® product would be best for you and your organization. Facilitative assessment for your immediate team lead, supervisor, etc.